It has been two weeks since the federal government of the United States ceased most of its operations. Everyone in the country knows this and understands that it has resulted in temporary layoffs for all government workers deemed ‘non-essential personnel’. But a relative few grasp the scope and severity of this shutdown for the conservation of natural resources and private lands, and all of the private citizens whose livelihoods depend on those lands. The shutdown’s most publicized effect on conservation is the closure of federal lands – national parks, forests, wildlife refuges, and BLM lands – to the public. Any vacation plans for these areas during the shutdown has now been dashed. Fortunately, all hope for a scenic vacation is not lost, depending on where you’re going. In some places, such as the Grand Canyon in Arizona or Mount Rushmore in South Dakota, there are state parks and scenic vistas nearby. A few National Parks are beginning to reopen aswell. The Wall Street Journal wrote a great article on the topic; 13 Ways to Salvage a Shutdown Vacation. While having to cancel a vacation may be disappointing, it pales in comparison to the economic hardships felt by gateway communities as a result of dwindling tourism. Many local communities surrounding popular federal lands depend on tourism for up to 75 percent of their revenues. Even the stewards of our federal lands are feeling the financial pinch from the government shutdown. With less and less federal spending allocated to conservation and public lands every year, the operating budget for federal lands is largely dependent on visitor fees. National forests and other federal lands, such as wildlife refuges, that allow hunting and fishing, when they’re open, are especially hard hit, as this is the peak of hunting season in many states. However, more devastating than the closure of federal wild lands is the shutdown’s impact on private land conservation. If you go to our Land Conservation Grant & Assistance Programs page on PLN said impact will become readily apparent. Do you see the dozen Fish & Wildlife Service programs that include, among others, programs to provide landowners with technical and financial assistance for protecting or restoring wildlife habitat? Consider them out of commission. What about the dozens of USDA programs from the Forest Service, Farm Service Agency (FSA), Natural Resources Conservation Service (NRCS), and others? Those are all shut down too. If you go to the USDA website you will be greeted with this message: Due to the lapse in federal government funding, this website is not available. In fact, you can now find more information on these federal conservation programs from our website than you can from the agencies that run them. Due to the government shutdown private landowners across the country were without access to USDA, NRCS, FSA, Cooperative Extension offices that provide information on land conservation techniques, as well as funding opportunities and procedures. Ag and Timber producers were without guidance from market reports due to the absence of the NASS, which has cancelled or postponed their reports. Moreover, the uncertainty will continue as offices address the backlog and until decisions are made on the Farm Bill, which expired October 1. America has long been a nation that takes great pride in its natural heritage and conservation ethic, and the unsung heroes of our nationwide conservation stewardship fabric are private landowners, who fortunately do not shut down. They are the stewards of much of the most vital habitat in the country. According to the Department of the Interior; “Approximately half of the listed endangered species have at least 80 percent of their habitat on private lands.” Thus, federal conservation efforts may have temporarily ceased, but private landowners continue to practice sustainable agriculture, improve the water quality of their lakes and streams, remove invasive species from their property, and conserve critical habitat. However, while the stewards of our land pride themselves on being self-sufficient, there are times when disaster strikes and everyone affected is in need of help, and this is one of those times. 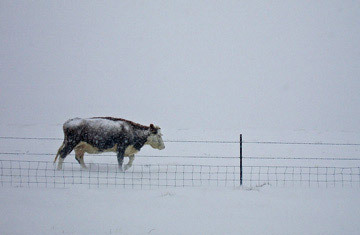 Ten days ago, a blizzard hit the Black Hills of South Dakota, surprising ranchers and leaving tens of thousands of cattle dead. Some lost everything. In the wake of this devastating storm, everyone is missing the assistance of their local NRCS and FSA officers on clean up efforts and calculating losses, and the disaster relief programs normally provided through the Farm Bill.